The Ultimate Guide to Chainlink | What Is LINK? Chainlink is a platform which builds a highly reliable decentralized oracle network. It also seeks to bridge the gap between real-world applications and smart contracts on the blockchain. Chainlink is the first decentralized oracle service. It improves smart contract interconnectivity by granting smart contracts secure access to reliable data feeds, APIs, payments and other resources. Essentially, Chainlink is a middleware between on-chain and off-chain systems. By giving smart contracts access to off-chain resources, Chainlink lets them react to real-world events and execute agreements that would otherwise need external proof of performance. The Chainlink ecosystem is built around the LINK network and LINK token. 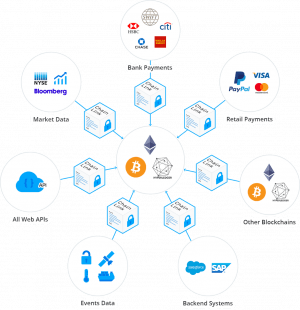 Initially, Chainlink solutions are built on Ethereum blockchain, but the company intends to support all major smart contract chains. One of the most prominent issues plaguing the smart contract technology is the inability to interact with resources running outside the node network where smart contracts are executed. The lack of connectivity limits what smart contract developers can create. For example, an app like Uber uses multiple data feeds (like GPS data) and key outputs (like payment gateways) to provide convenient services for everyday use. Without the proper link to such and similar off-chain resources, smart contracts are bound to the on-chain data only. Bringing access to the exterior data would allow for a new wave of advanced smart contracts and decentralized applications. In any case, such external inputs and the outputs already exist as APIs and data feeds. Most web and mobile apps use them. The critical issue Chainlink faces is how to integrate them into smart contracts in a way that retains most value to the end users. In other words, there needs to be a way to create smart contracts that encompass reliable external data. The connectivity issue also goes the other way around, as smart contracts can’t output data into the off-chain systems. Granting the ability to push data to various APIs and legacy systems would facilitate the development of externally-aware tamperproof contracts which could trigger off-chain actions. An oracle is an agent which provides valuable, inaccessible information on real-world events. Before the invention of smart contracts, digital agreements were embedded in code which could’ve been altered, terminated or even deleted by a party which controls it. Smart contracts are changing the game, kicking off a new era of decentralized, tamper proof, self-verifying and self-executing agreements that bind all parties to deliver as promised. Fundamentally, it redefines the traditional paradigm of trust relationships as it requires no trust in any single party. However, if a smart contract executes in reliance on only one centralized source of data, the essence of decentralization loses the edge. All existing oracles are centralized services. Using them introduces a point of failure, which makes smart contracts no more secure than traditional centralized digital agreements. Therefore, when smart contracts eventually replace old digital agreements, they will need high-assurance versions of data inputs and outputs. Chainlink uses different nodes to obtain the requested data. They form a consensus before returning the data to the smart contract. This way the smart contract doesn’t rely on a single oracle. Also, Chainlink nodes can conduct both one-time and multiple times data retrieval tasks. The data reception can be scheduled, which turns Chainlink nodes into a sort of “data feeds” for smart contracts. The Chainlink network has two interactive parts: the on-chain and off-chain components. Chainlinks on-chain component is made of oracle contracts on Ethereum’s blockchain. They monitor and process the users' data requests. Whenever there is a request for some off-chain data, they transfer the request (contract) to the Chainlink network, where it’s processed into a native blockchain contract. Then, these Chainlink contracts match the request with a suitable oracle service. The Chainlink contracts are made of three parts: a reputation contract, an order-matching contract, and an aggregating contract. The reputation contract records oracle-service-provider performance metrics and checks its track record. The order-matching contract logs the user's proposal on the network, collects bids from the oracle providers and selects them according to the reputation contract analysis. The aggregating contract collects all the oracle providers responses and computes the final collective answer to the original query. With these contracts at work, the Chainlink's on-chain unit follows a three-step process: 1) Select an oracle; 2) Report the data; 3) Aggregate the results. User contracts also can charge the oracles a penalty fee for inappropriate/false information. It incentivizes the oracles to provide fair and reliable service. The second critical part of Chainlink architecture consists of off-chain oracle nodes that connect to the Ethereum network. These nodes harvest responses to the external requests. The individual responses are summed up via several consensus mechanisms and then are turned into a single, reliable global response and converted to a contract. The gathered data is processed via Chainlink Core, the crucial component that connects the blockchain and off-chain data resources. The Chainlink Core is the device which translates off-chain data and sends it to an on-chain oracle. The off-chain nodes are compensated with LINK. They also allow for the integration of external adapters that are written by developers to perform various subtasks, making the data collection much more productive. The Chainlink nodes have already been installed next to the public blockchains and private enterprise networks. The core task of the Chainlink network is to make it possible to run them in a decentralized fashion. Traditional oracle protocols are centralized. They introduce a potential failure point for smart contracts, which have to rely on the oracle to execute their program. However, nothing prevents someone to meddle with centralized oracle protocol data. It can be used to manipulate favorable outcomes. Chainlink addresses it with what it calls source and oracle distribution. The source distribution means oracles can draw their data from multiple sources to maintain a good reputation. Oracle distribution means that requests made to the Chainlink network are contracted to several oracles. The system also keeps the oracles honest, since their data is measured against other oracles. If an oracle begins to push false data, it’s immediately punished by the network and damages its reputation (along with other penalties). As a result, the network offers a fully decentralized approach which guarantees top quality data delivered by multiple oracles and agreed upon by the consensus mechanism. Chainlink proposes a decentralized oracle network. The decentralized oracle approach limits reliance on a single source of data. Next generation securities contracts like bonds, interest rate derivatives, and other agreements that need access to API’s to retrieve the latest market prices, interest rates, and other reference data. Trade finance smart contracts that need access to data from supply chain systems, customs and GPS data on shipments. Insurance smart contracts. They are likely to use IoT data feeds related to the insurable events. For example, in case of robbery, it would be possible to check whether the warehouse’s door was locked, or, in case of fire, they could retrieve the latest data from fire detection systems. Chainlink was launched in June 2017 by the San Francisco tech company SmartContract. The project is led by the CEO Sergey Nazarov and CTO Steve Ellis. Sergey Nazarov is a serial entrepreneur known as a founder of SmartContract, Secure Asset Exchange and CryptoMail - a decentralized email service. Before co-founding SmartContract, Steve Ellis worked as a software engineer at Pivotal Labs and Secure Asset Exchange. Besides the founder, as of 2018 December, Chainlinks’ website lists 16 team members and advisors. The Chainlink ICO has occurred on September 19, 2017. The token sale was a success, reaching its cap at $32 million in just 2 hours. However, it didn’t go without controversy, as $29 of those $32 millions were raised in pre-sale, leaving less than 10% of the tokens for the official public sale. 1 LINK was sold for approximately $0.11. The company issued 1 billion LINK tokens in total. 35% of the tokens went to incentivize the Node Operators. Other 35% were sold in the pre-sale and public sale. The company reserves the remaining 30% LINK tokens. They are kept to compensate the project developers and staff. That leaves 350,000,000 LINK in circulation. LINK is an ERC-20 token with the additional ERC223 “transfer and call” functionality. It allows tokens to be processed and received by smart contracts within a single transaction. 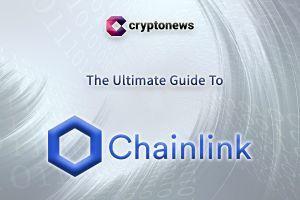 The LINK token is used in the Chainlink network to compensate Chainlink Node operators for the retrieval of data from the external data sources, turning it to blockchain readable format, off-chain computation, and uptime guarantees. For instance, if a company wants to use smart contract enhanced with a Chainlink node, they can do so with LINK tokens only. The Chainlink Node Operator determines the final price according to the demand for the off-chain resource and the supply of similar information. Such a model of LINK token use has raised some arguments about the utility of the token. Some commentators say other cryptocurrencies are better suited to pay operators. Binance (paired with BTC, ETH). Huobi (paired with BTC, ETH). Bitrue (paired with BTC, ETH, XRP). Mercatox (paired with BTC, ETH). Gate.io (paired with ETH, USDT). COSS (paired with BTC, ETH). The only exchange where you can get LINK with fiat is South Korea’s leading exchange Bithumb. It accepts deposits in South Korean Wons (KRW), but only from Korean residents. Where to Store Chainlink?As an Ethereum ERC-20 token, Chainlink can be stored in every wallet which supports Ethereum tokens. Most popular options include wallets like Metamask, Mist, MyEtherWallet, Trezor and Ledger Nano S.
It’s hard to project Chainlinks current state because the company didn’t release any formal roadmap. However, the project team has already launched a testnet with seven functional Chainlinks, allowing developers to interact with BraveNewCoin, CoinMarketCap, CryptoCompare, Kaiko, EasyPost, FlightStats and Chainlink Alarm Clock APIs. In the latest news, the company has acquired Cornell’s Town Crier project, which will be used for the further development of its trusted oracle system. SWIFT - the international interbank communications network. Zeppelin OS - an operating system designed for smart contracts. Wanchain - an infrastructure for connecting different digital assets. Signal Capital - a London-based private asset company. Request Network - an exchange seeking to become the standard for exchanging fiat and cryptocurrencies. Morpheus.Network - a global and automated full-service supply chain platform utilizing blockchain technology. Mobius (MOBI) - develops oracles for consumer applications on native dApp store. Augur (REP) - focuses on oracles for the prediction markets that allow betting on future events. Gnosis (GNO) - a decentralized marketplace to wage on future events. Witnet (WIT) - general purpose anonymous oracles.